A strong and sporty look for this man’s watch with a silicone strap from the Sealion collection. A very impressive model, but always in the Philip Watch style, elegant and with vintage references. In this collection inspiration is not limited to the retro style, but in particular to the watches worn by scuba divers, the explorers of the abysses. For those who love the sea and cannot wait to discover the fascinating world that is hidden below its surface, this Sealion model is definitely appreciated. The soft black silicone strap embraces a 42mm steel case, enclosing a sunray blue quadrant, just like the ocean. Strong yet elegant colours that express perfectly the sporty style and huge personality of this time-only with date. The look of the case is completed by a one-directional rotating lunette in the same colour as the black strap and with a resistant sapphire glass. 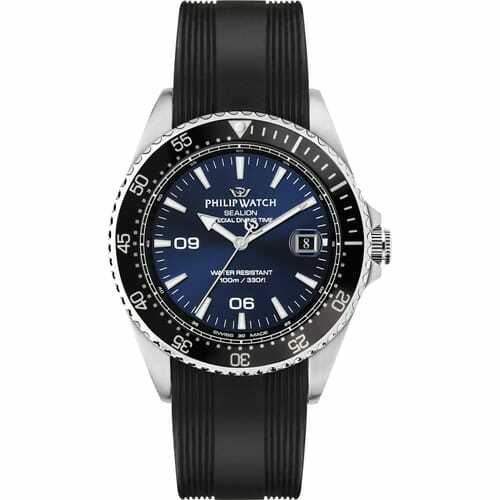 Passion for the sea and for the marvels that it contains are perfectly combined with the precision and distinctive appearance of every Philip Watch. This watch has several specific features, such as the luminescent hands and indexes for excellent reading in the water and water resistance, guaranteed up to 100 metres. An impeccable style, immersion proof.